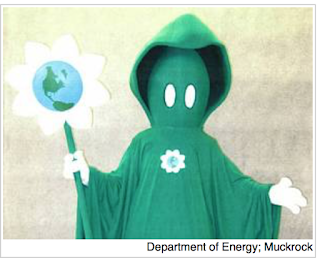 Introducing the Green Reaper, a monstrosity created by the Obama Administration with the intention to scare children -- children! -- about global warming. There is no other word to describe creating and playing on children's fears but evil. Earlier this week, I wrote about global warming alarmism has taken on all of the characteristics of a religion. I guess the final piece is in place: a devil. The goal was to send the green reaper to elementary schools.